It could come on suddenly, in the middle of your daily activities. You could wake up with it. Or it may take a while to advance. No matter how it develops, a migraine can be debilitating, often making everyday tasks impossible. The only cure seems to be a dark, quiet room to sleep off the pain. It can sometimes be difficult for migraine sufferers that those who do not experience the pain often dismiss it as ‘just a headache’. But migraines are so much more than that. Migraines are a form of headache that can last up to 72 hours. Symptoms include throbbing pain that can be aggravated by movement, nausea and vomiting, sensitivity to light and/or noise, and difficulty concentrating. Early warning symptoms – these may start up to 24 hours prior to the migraine hitting and include changes in mood, changes in or lack of appetite, drowsiness, difficulty in eye focus, general aches and pains, and fluid balance changes. Aura – the most common aura symptoms are seeing zigzag lines or flashing lights and difficulty focusing. Headache – this can last up to three days, and is often throbbing and one-sided. Movement can make it worse. Headaches can be accompanied by sensitivity to light, sound and smell. 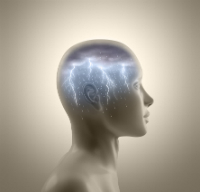 Resolution – the way a migraine ends varies. Sleep, being sick or medications are common healing factors. For some, nothing works except allowing the headache to take its course. Recovery – you may feel drained for some time or you may bounce back with more energy. It depends on your body. Caused by swollen blood vessels in your brain, migraines send out signals that your body interprets as pain. Research has found that the cause of migraines may be a faulty gene in the brain that triggers nerves to over-react, prompting the body to feel more pain. There are also certain triggers that may bring on a migraine. If you skip or delay a meal, or miss your morning coffee, it may cause a headache. Other dietary causes include alcohol, MSG and dehydration. There are also environmental factors that may contribute to a migraine including harsh, bright sunlight, strong smells and weather changes. Other triggers include hormonal changes, lack of sleep, back and neck pain, and vigorous exercise. Some people can also be prone to migraines caused by emotional factors including arguments or stress, or sudden relaxation after stress. Identifying what triggers your migraine may be difficult as a combination of factors could contribute to any one attack. While migraines are generally most common in younger females, it’s not unusual for someone who has never had a migraine before to suddenly develop a migraine or tension headache. This can often follow a major life change, such as retirement. As you get older, migraines may change their shape and form. They may become less frequent and less severe, and headaches may change character. However, you may be one of the unlucky ones whose migraines continue into later years, or who develops migraines and tension headaches as you get older. Tension headaches can be caused by back or neck problems, a change in sleep schedule, anxiety, or emotional stress. While migraines are mostly hereditary, tension headaches are largely caused by emotional or lifestyle factors, the most common being stress. Treatment will differ from person to person. If your headache is a new kind of pain, the first thing you must do is see your doctor for a thorough examination to make sure it’s a headache rather than an illness or irregularity in your body. For some, medication will work, whether over-the-counter or prescription tablets. For others, a long restful sleep in a dark, quiet room may do the trick. For some there’s nothing that will make the pain go away. One way to manage a migraine is to keep a headache diary, detailing the dates you suffer and what happened that day and the day prior, including diet, any stress factors, change in weather or change in lifestyle. It’s also important to note any medication that you may be taking as it can be a contributing factor to migraines and tension headaches. There are also some complementary therapies that you can try. Acupuncture encourages the production of endorphins, which act as natural painkillers. This may help ease the pain. Aromatherapy is a good one to try as long as smells don’t worsen the migraine. The scented oils promote relaxation. Hypnotherapy has worked with smokers, alcoholics and to treat obesity. It works to trick your body into interpreting messages differently. Osteopathy works to correct misalignment of the vertebrae, which is a common cause of migraines and tension headaches. Treating a migraine or tension headache with natural therapies can sometimes be a process of elimination. If one form of therapy doesn’t work, try another. Of course, you should always consult your doctor before trying anything new. Your GP will be able to work with you to prevent and treat any form of headache you may experience. Want to keep tabs on your migraines? A great smartphone app to use to keep tabs on your migraines is iManageMigraine, downloadable through the iTunes store or on the Headache Australia website. Do you suffer from migraines or tension headaches? Share your tips and tricks to deal with them on our Facebook page.